Todd Palin, the husband of former US Republican vice-presidential candidate Sarah Palin, has been injured in a snow machine crash in Alaska. Mrs Palin has cancelled an appearance at a campaign event for 2016 front-runner Donald Trump in Florida. In January she endorsed the front-runner in the race to be Republican presidential candidate. 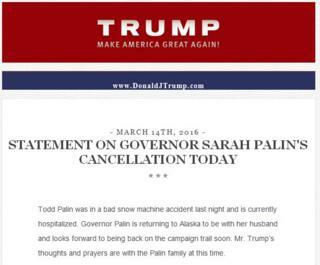 A statement from the Trump campaign described the accident as “bad” and said Mr Palin was in hospital. A former governor of Alaska, Mrs Palin retired in favour of a media career, but remains an influential conservative voice. On Tuesday, Republicans and Democrats vote in primaries in several states including Florida and Ohio. Mrs Palin made appearances on Mr Trump’s behalf at two events on Sunday. “Governor Palin wishes her best to Mr Trump in the upcoming primaries,” the Trump campaign said.